For decades, the decline in China’s birth rate was a big boost for the economy. What now? This week, schadenfreude could have been a word invented for China experts if you judge by some of the commentary surrounding the country’s lifting of its one-child policy. 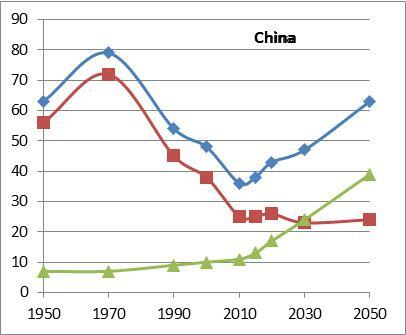 Most got it right that the legacy of the one-child policy is now a problem for the Chinese economy because of a rapidly rising old-age dependency ratio (green line in the first chart below). This was tacitly acknowledged by the lifting of the policy. But many got it wrong that the one-child policy has always been a problem for the Chinese economy since its inception. The cause of their error is the inclination in some quarters to merge a political and moral issue with an economic one, as if to press the point that unfree and coercive decisions are not only bad eventually for the economy, but bad always and from day one. Unfortunately, economic accountability does not come instantaneously after coercive policies are implemented. Politicians are lucky in that the ultimate consequences of their decisions can take years or even decades to finally be seen in full relief. Before this occurs, the more immediate and proximate result of a bad policy may in fact be hugely positive for a long time. The reason is that a bad policy can borrow prosperity from the future, or in other words, front-load prosperity to the detriment of future generations. By enacting a policy that pulls prosperity forward, the present can look like a boom but the future then has to contend with the reversing undertow of that same policy. At any rate, it is right that a free society focuses on the one-child policy’s encroachment on personal freedom and on the unintended consequence of a lopsided male-female ratio. But ignoring these very important issues for a moment, it must also be said that the one-child policy was in fact a significant contributor, arguably even a critical enabler, of the Chinese boom of the past few decades. There is no mystery here because the chain reaction is well understood by demographers and economists, albeit perhaps forgotten or ignored by some this week. 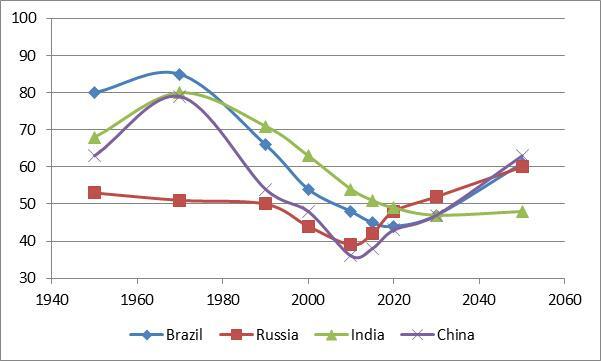 As the Chinese fertility ratio declined, so did the total and child dependency ratios (blue and red lines in the chart), opening a window of opportunity for a demographic dividend. China’s policymakers managed to seize on this window to accelerate the economy. Here business dynamism, economic policy and the large expansion of trade with the US, Europe, Japan and other economies made a big difference and allowed the country to capitalize on the opportunity and to reap a large demographic dividend. But there is no free lunch in economics or indeed in demographics. The long-term effect of the one-child policy was to pull prosperity forward by crashing the dependency ratio faster and generating a demographic dividend that was far larger than would have been if households had had more children. 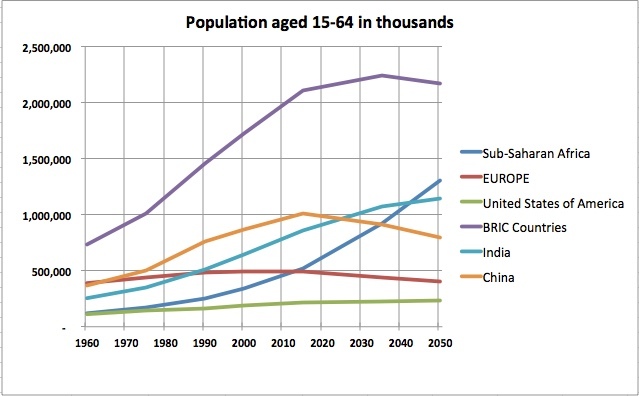 Without the one-child policy, China’s dependency ratio would have fallen more slowly between 1980 and 2010 and may have looked more like India’s (chart below). The decline would have been less pronounced in 1980-2010 and therefore the demographic dividend less great, but the climb would be less steep now and therefore the future less challenging. See Demography Charts – 1 for dependency ratios of other countries. With only one child to support aging parents, the dependency ratio has started a climb that will continue for several decades. Should the removal of the one-child policy result in more children, this would in the near term push the dependency ratio to rise even faster. As sure as demography was a tailwind in the years 1990-2010, it will be a headwind for decades to come. This does not mean that the Chinese economy will be weak for decades. Demographics is only one component among many and economies can adapt to changing conditions. Should there be a surge in Chinese innovation and/or new reforms to raise productivity, China could very well skirt or mitigate the coming demographic challenge. China’s target for annual real GDP growth is now 6.5%, compared to nearly 10% on average since 1980. These figures must be seen against the backdrop of a working-age population that rose steadily from 500 million in 1975 to a billion in 2015, and that is expected to level off and contract to 920 million by 2035. See also Working Age Population Around the World 1960-2050. Harvard Professor Amartya Sen writes in the New York Times that the empowerment of women had more to do with China’s declining fertility ratio than did the one-child policy. This is credible on the one hand because the fertility ratio had already declined significantly by the time the policy was enacted. But it is not wholly credible on the other hand because it does not square with the issue of selective abortions. It seems odd that empowered women would have a bias for male children. Perhaps the chronology of events must be examined more closely in order to validate Professor Sen’s thesis. In this Wall Street Journal piece, economist Nicholas Eberstadt seems to ignore the demographic dividend when he writes that “the one-child mandate is the single greatest social-policy error in human history.” As argued above, this is true from the point of view of individual freedom, and maybe true for the Chinese economy going forward, but certainly not true for that economy from 1980 to today. The total dependency ratio is the ratio of the population aged 0-14 and 65+ to the population aged 15-64. They are presented as number of dependents per 100 persons of working age (15-64). The child dependency ratio is the ratio of the population aged 0-14 to the population aged 15-64. They are presented as number of dependents per 100 persons of working age (15-64). The old-age dependency ratio is the ratio of the population aged 65 years or over to the population aged 15-64. They are presented as number of dependents per 100 persons of working age (15-64). ← Report: Africa’s Demographic Transition, Dividend or Disaster?